Looking to track your weight loss? Want a simple solution to use on your Windows Phone? 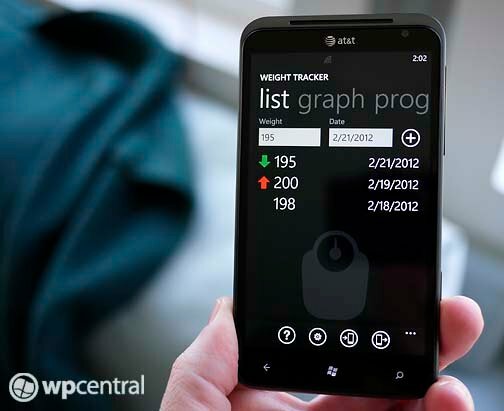 Take a look at the Windows Phone app Weight Tracker. Weight Tracker is a simple, straight forward app to track your weight loss and chart your progress towards your targeted weight. It's a handy way to track your progress as the Mobile Nations Fitness Month winds down. Weight Tracker has three main pages. The List Page is where your individual weigh-ins are recorded and listed. The Graph Page charts your weight loss and the Progress Page lists your targeted weight to lose and the day remaining to attain your goal. Weight Tracker is simple to set up. Just tap the Settings Button at the bottom of the screen, enter your target weight and when you'd like to reach that goal. As you progress with your exercise and diet plan just enter each weigh-in on the List Page. Weight Tracker will then adjust all the charts, graphs and progress reports accordingly. If you enter a weigh-in incorrectly, just tap/hold that particular entry and a pop-up menu will appear with the delete option. Weight Tracker also has the capability to email your charts (text format) and import data. There are two buttons at the bottom of the app to access these functions. The import function has detailed instructions and is basically cutting/pasting your stats. It's a little cumbersome process and I couldn't help but think that there is an easier way to go about it. All in all, Weight Tracker isn't a shabby app for monitoring your weight loss and goals. I would have liked to have seen a notes section added to the weigh-in entry or a better way to export/import (maybe excel format?) your data. Still, Weight Tracker is a nice, basic weight tracking app. There is a free trial version available for Weight Tracker to let you try before buying. The full version of Weight Tracker will run you $1.99 and you can grab it here at the Windows Phone Marketplace.